Late last week Apple unveiled their next operating system: Mountain Lion. Basically, OS X gets a bunch of iOS functionality with it. One of those is Messages (called iMessage on the iPhone). Unlike the other new features, this one actually came out in beta for anyone to download and try. So, that's what I did. 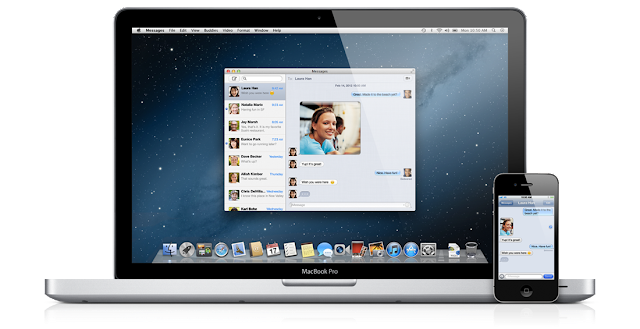 Sync all messages with iCloud. Currently, only new conversations I start on Messages show up. I'd like to be able to reference and search all of my old ones too. Improve network syncing. There are times when only my computer or phone will get the message. Then minutes later (which is forever in a conversation) the other device will start pinging like crazy as it catches up. Only ping the device I'm on. Apple runs the hardware and the software. Therefore, it should know if my iPhone is locked or open when I make a reply. At the very least, they should know which device I replied from. They should be able to set up rules to have all other devices silently update in the background if I receive a new message shortly after I sent one. Enable IM on my iPhone. Let me hook up my Facebook, Google, AIM accounts on my phone so I can talk to them while on the go too. Or, you know, save all my settings in iCloud so it's all there when I pick up my device. Oh yeah, don't forget to sync all those conversations too. Enable SMS. Google Talk has that option, and it's pretty nice. This would complete the "keep everything in sync" circle. Though, I suppose I could put up with not having this in Messages if it speeds up the death of SMS. That's not asking too much is it? If this level of integration is any indication of how the other apps/features are going to work, Mountain Lion is going to be awesome. The idea of iCloud being the main hub, keeping all your devices in sync is really appealing. It seems to me that this is what Apple wanted Lion to be originally, and now we're really starting to see that vision come into focus.